Barnard, Robert. Too Many Notes, Mr. Mozart . Little, Brown 1998. What if: During a visit to England to show off his prodigy son to the English court, Leopold Mozart decided to remain in England as a result of being accidentally overpaid by a royal courtier. Series note: Whodunits Dead, Mr. Mozart and Too Many Notes, Mr. Mozart . Comments: The cover of some editions credit "Robert Barnard writing as Bernard Bastable". Summary: In 1820, Mozart is working on a coronation piece for King George IV when he discovers his theater is involved in a plot to discredit the queen. When the plot leads to murder, Mozart begins to investigate. 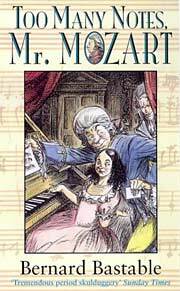 Series note: First of the Mozart Mysteries. Published: Little, Brown 1995 (0316911682); St. Martins 1995 (031211771XBUY); Warner 1995 (0751510920BUY). Translation: French by Isabelle Maillet as Un requiem pour Mozart , Librairie des Champs-Elysées 1997 (2702495486). Summary: The aged Mozart is hired to teach music to the young Princess Victoria and must solve the mystery of who wants her dead. Series note: Second of the Mozart Mysteries. Published: Little, Brown 1995 (0316878081BUY), 1998 (0751518069BUY); Carroll & Graf 1996 (0786703156BUY); Warner 1997. Translation: French by Isabelle Maillet as Trop de notes, Mr Mozart , Librairie des Champs-Elysées 1997 (2702495478).